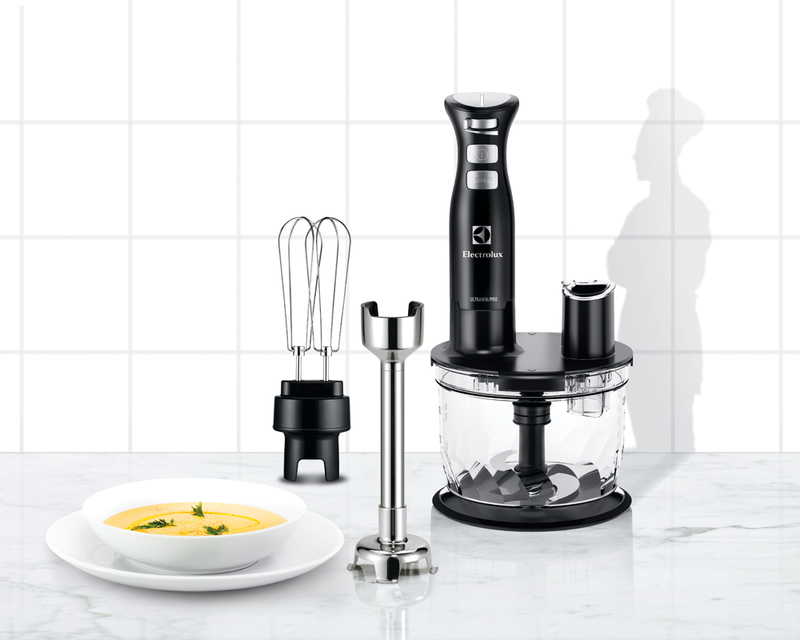 A while back we were asked to come up with a recipe that could illustrate the different functions of an immersion blender and food processor. 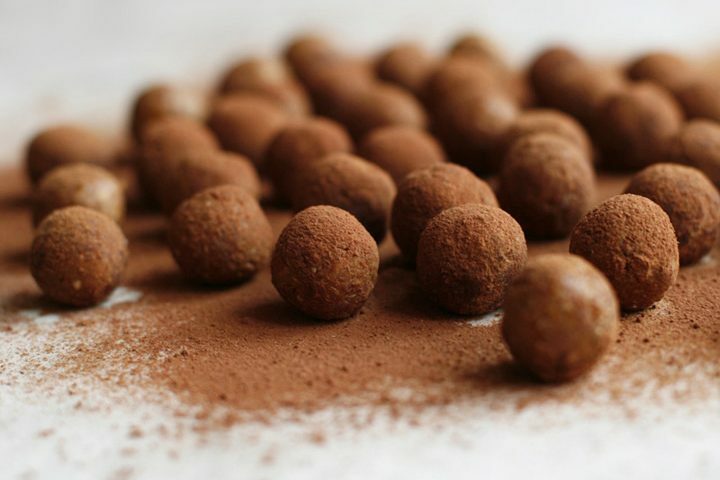 Considering that we use ours everyday to blend soups, making pesto and mixing date truffles, you could say that we are somewhat experienced on the subject. After some twisting and turning we decided to make an apple tartlet. Our flour free version is made on oats, sunflower seeds and dates. Topped with toasted nut butter, beautifully arranged thin apple slices and a touch of cinnamon. It’s vegan. Gluten free. Delicious. And oh so simple. 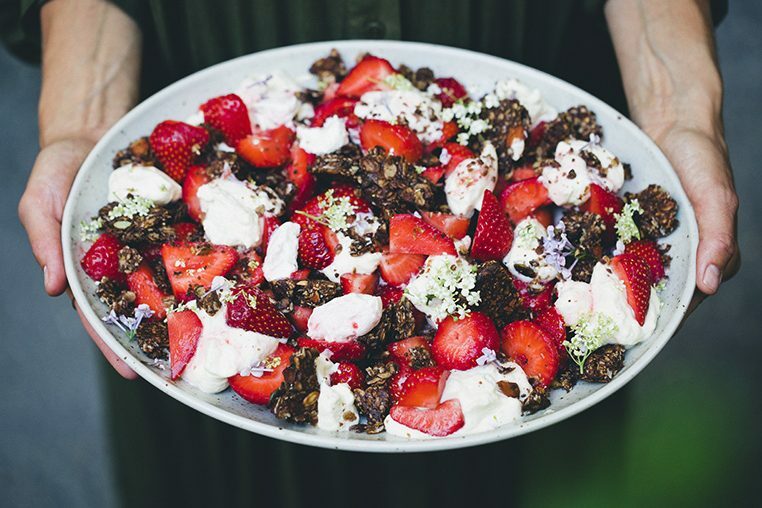 Hit your local market, load up on apples, oats and seeds – and you’ll have friends and family beaming from ear to ear. Recipe at the bottom of this post. Electrolux used our recipe for their video campaign Now you’re cooking, which basically is a marketing event for the Ultramix Pro. All of the videos in that series are actually really beautifully done. It was fun to see how they interpreted our recipe. All the photos in this post are our own, but the video is entirely produced by Electrolux. Now to the groovy part – Hey hey, we’re doing a Giveaway! Update – The giveaway is now closed. We will notify the winner within a few hours. Together with Electrolux we are giving away a Ultramix Pro ESTM6600. A stick mixer that comes with all kind of accessories. A 10 inch (25 cm) extra long mixing bar, double whisk, food processor, blades and the new slicer accessory which we used to make the apple slices. To participate, just leave a comment with your name, where you are from and your favorite recipe from our blog (we’re sooo curious!). The giveaway is open for all our readers worldwide. We will draw a winner randomly on Tuesday March 26th. Good luck! 1. Preheat the oven to 200°C / 400°F. 2. Place rolled oats and seeds in a food processor and grind on high speed for about 30 seconds or until you get a crumbly oat & sunflower flour. 3. Add pitted dates, coconut oil and salt and blend for another 30 seconds until the mixture comes together to a sticky and crumbly mixture. 4. Grease four 4-inch / 10 cm tartlet pans with coconut oil. Divide the mixture evenly in the pans and use your finger to flatten it out on the bottom. It should be quite compact. Pre-bake the crust for about 10 minutes. 5. Meanwhile prepare the apples by dividing them in half and removing the core. Mount the thin slice blade on the food processor, and use it to slice the apples halves into thin wedges. Remove the lid and squeeze some lemon over the apple wedges to prevent them from turning brown. 6. 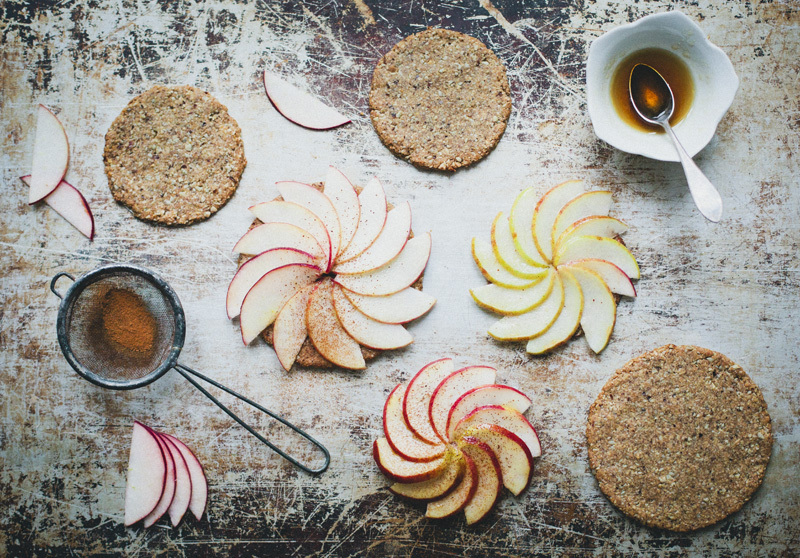 Add 1 tbsp almond butter on each crust, then arrange the thin apple wedges in a circular shape on top. Tuck in the last piece under the first so it forms a seamless circle. Brush with maple syrup and olive oil and dust cinnamon on top. 7. Place the tartlets in the oven and bake for another 10-15 minutes, or until the apples are golden on top. Let cool slightly before serving. 8. 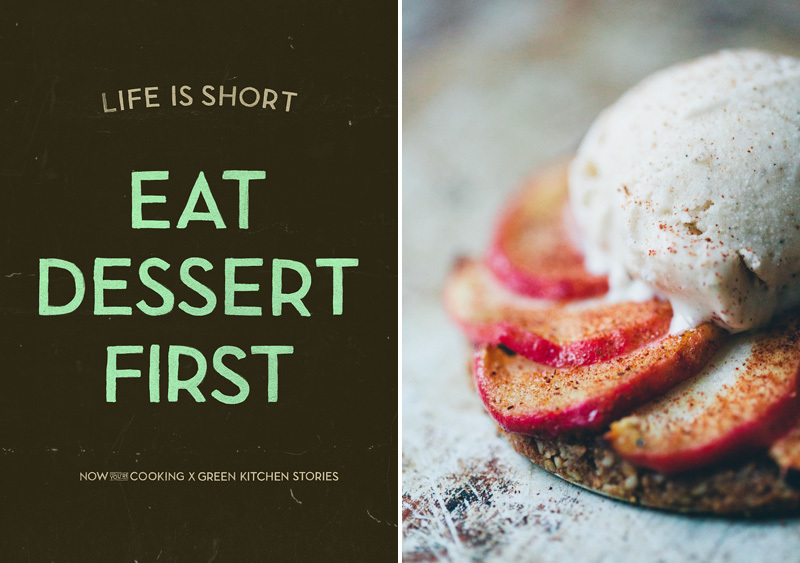 Serve as they are or with a scoop of vanilla ice cream, nice both ways. Green Lentil and Yellow Beet Salad! Dears, I bought 4 different kinds of beans because of you. I love the Chili, even when I have to start with the beans one day before getting hungry. www.greenkitchenstories.com/bean-chili-with-walnuts-chocolate I live and eat in Austria and send you best wishes for your (now not very very new) but new book. i think the shaved brussel sprout christmas salad might be my current favourite. i am always looking at ways to spread the word of brussel sprout tasty goodness. it can be a hard sell for some! 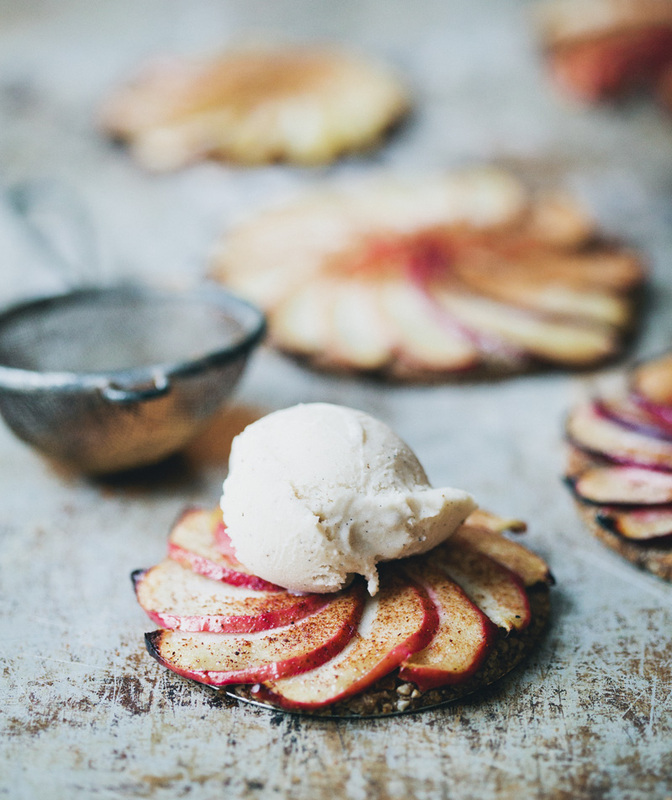 although, the apple oat tartelette recipe above looks deeeelicious! Hej! My name is Steffen, i'm living in Stockholm and i've been reading your blog in quite some time now. 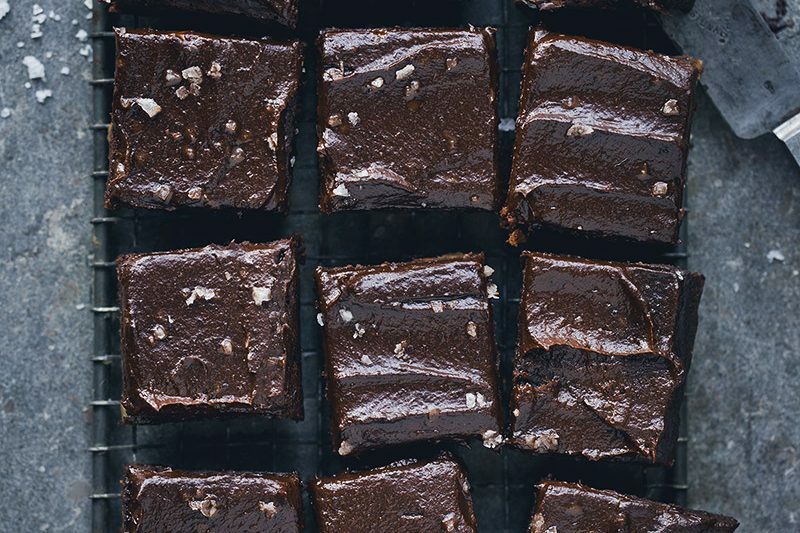 Favorite recipe is hard to tell, but the one i've used the most is your bean brownies. 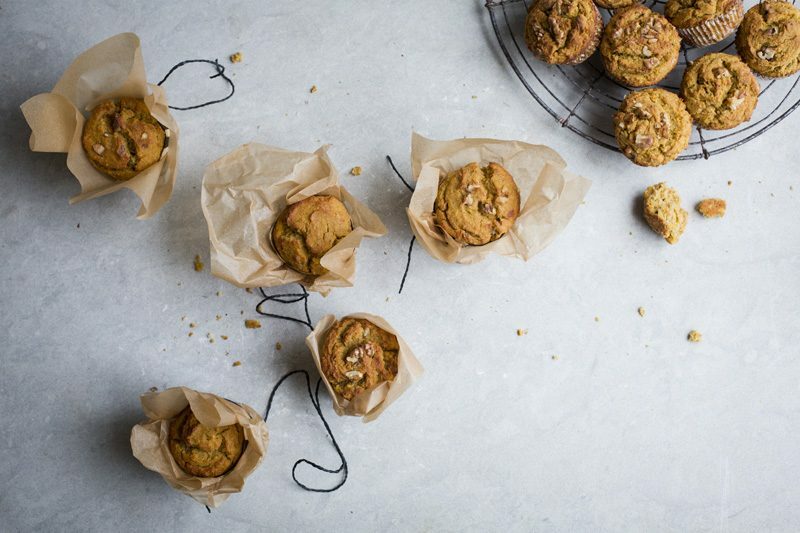 I've baked them in many different variations - they taste gorgeous every time, and my gluten-intolerant colleagues at work simply love them (as do all the others). :) So keep up the good and inspiring work! Thank you! I'm Brooke from Salt Lake City, UT, USA. I loooove your pistachio falafel lettuce wraps! Hi! I am Helle, I am Norwegian, but live in Copenhagen. My favorite recipe is the involtini di melanzane - I have no idea how many times I´ve made it, it´s really a winner! I have to make these tartlets as soon as possible! My name is Caroline, I'm from Denmark, and my favourite recipe must be your banana and blueberry pancakes, I've made them more times than I can remember. Those look absolutely beautiful, I can't wait to try them! My name is Kate, I am from Nova Scotia, and my favourite recipe of yours (today) is the yoga pot. It really got me back into taking the time to cook properly for myself again. My favorite recipe is the Tumeric Lassi! I have had one almost every day since the recipe was posted. I'm Marisa from Alabama USA and I love your style! This is def my favorite! Can't wait for the snow-storm in Copenhagen, Denmark to be over. When spring is arriving I'll drink this on my balcony. That's for sure! My name is Emma, jag bor i Sverige, and my favourite recipe is the Linguine della via di Grotta Pinta 45. It may not be the most complicated dish you - or I - have produced, but it really celebrated good produce - which I love! Oooo, what a fun giveaway! But OMG how difficult to choose just one of your recipes... I've seriously made ALOT of your food and loved every single dish. But if I have to choose one I think I must go for... Mustard, Quinoa,Cranberry and Kale Salad. At a close second is your Bean Brownie, which I actually have a batch of in the freeze as we speak.